Discussion in 'Civ5 - General Discussions' started by Nance, Oct 20, 2010. I don't know if I'm the only one that like Civilization music. From the World of Jules Verne in Civilization II to John Adams music in Civilization IV. I still believe that Civilization IV have the most complete soundtrack of the series, just take a look at this at the article in Wikipedia for this. 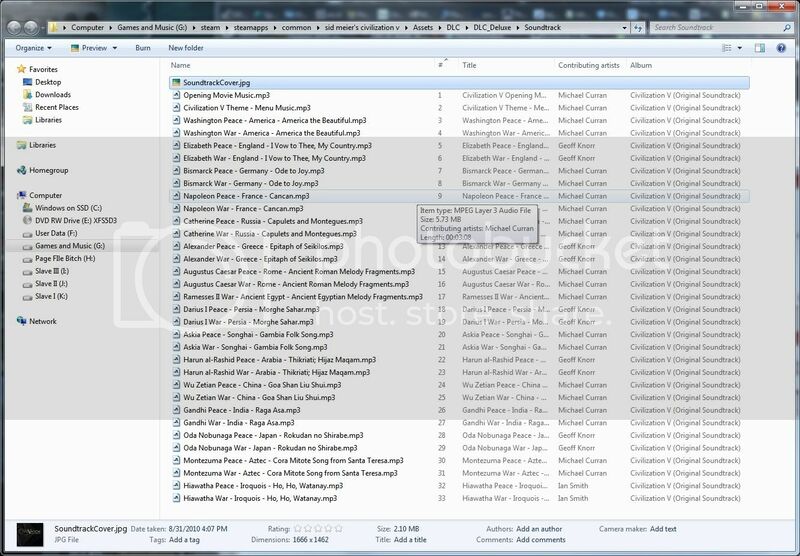 For what I understand for Civilization V, most of the music from the soundtrack are composed by Geoff Knorr and Michael Curran, but they also take stuffs from classic composers, if you look the Europe music folder, I'm not sure for the other ones. Edit: This is not complete. Thanks for everybody that help us! The Dvorak Larghetto is my favorite! Give a man a fish, you feed him for a day. Teach a man to fish and you feed him for a lifetime. Sicilienne by Gabriel Fauré in Europe Peace. I've put together an amazing soundtrack for civilization. Someday I will release it online... I guess legally I cannot get you to download it, as it would be file sharing. But I suppose I can post a list of the tracks. Thanks for adding these. Will be adding it to my personal collection soon. Oh, and by the way. I turn off the music in all of my civ games, open up itunes, and select a soundtrack. I have three playlists (to keep things simple) composed of Ancient, Classical, Modern. I prefer more ethnic drum-based tracks in the ancient section, with music from "Dead Can Dance" sprinkled in there too (soundtrack from Baraka).. several middle-eastern songs I've collected over the years, and great celtic tracks. Then after my civilization advances, I start playing the Classical playlist which is composed of the famous composers like Beethoven etc. Once you get into the Modern age, I've selected tracks from films and more modern composers. Listing of all the licensed music anyways. I loved this in IV, and I'm glad it made a return. It's absolutely perfect for what they're using it for. Thanks for the list of licensed music credits! All in all, I'm very impressed with the quality of the pieces they've selected for CiV, I'm still torn between Gandhi's Raga Asa or Elizabeth's I Vow to Thee My Country as my favorite leader music... although Gengis Khan's Traditional Mongol Melody could be the tie breaker. Thanks you so much! Merci!!!!!!! This is still a bit nighmarish because we don't know which song is which file, which folder, but this is a beginning, a strong beginning! Yes! I will take a look of all this, then I will update my first post. So the ones that want the infos could all have it in one place. I update the list, this is a huge improvement, but some are missing. This site help a lot for the licensed music (merci! ), but they are still some unknown classic composer, especially for the "courtesy of dewolfe music" (that use classical music from composer bizet, grieg,...). Also, some unknown could be original from the game. I edit the first message with some found unknown. I wish they had divided music by eras again. Except then I never wanted to leave the classical era in the hope that that one song would play. I found a few more. Ancient Xiang Shan Melody, The Dragon Emperor's Lament Lotus and Mei Yun Melody are all traditional Chinese songs played by Yun Qu. See http://www.classicsonline.com/catalogue/product.aspx?pid=5455 . Civilization V Collectors edition comes with 2 soundtrack CDs. "For each of the leaders in Civilization V, we have chosen actual melodies from the leader's civilization as a starting point for our peace and war music. It has been a fascinating glimpse into the richly diverse musical styles our world encompasses. Enjoy !" Thanks I update the list. what's the song for mongolia where they say "ding, ding" in it?